How does it work and how can it be verified? One of the advantages of a diver’s rebreather is that the gas consumption is much smaller than open circuit diving. In fact, the gas consumption mostly depends on the O2 consumption of the diver, which depends on the diver’s workload. There are several methods in use for controlling the O2 level. 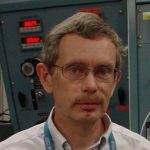 The difficulty is to a find solution that is relatively simple and that maintains acceptable levels of O2 even when depths and diver workloads change. Once a design has been completed it has to be tested to see how well it works. The simplest rebreather is one that has an O2 bottle, a breathing bag, a CO2 scrubber, and a mouthpiece with hoses. The addition of O2 can be made manually and/or by an O2 add valve that is mechanically activated when the breathing bag gets small and pushes on it. A drawback is that with 100% O2 the depth range is limited to 6 msw. For a larger depth range, another fairly simple way to control the O2 levels is to have a constant flow of a gas containing O2, and nitrogen and/or helium. The diver will consume some of the O2 and the remaining gas will bubble out into the water through a valve, hence the name semi-closed rebreather. This design may mean very few parts. To control the resulting O2 level in the breathing gas, the designer has to find a compromise between O2 concentration in the supply gas, its flow rate, maximum depth and endurance time. The often varying O2 levels might make the choice of decompression table difficult. The constant flow means that the endurance time can be well known, essentially determined by a stopwatch. A more sophisticated way to control the O2 levels is to determine how hard a diver is breathing. Instead of breathing to and from a bag, the diver breathes to a bellows which is linked to a mechanical or electronic counting mechanism or equivalent device. When the bellows has moved sufficiently (i.e. one breath or several breaths), the rebreather injects a known volume of fresh gas to replenish the O2. The designer has to choose the volume of gas to inject and its O2 concentration for a given range of depths. A difficulty is that the O2 consumption is not always well correlated with the volume breathed. The ratio of the volume breathed to the volume of oxygen consumed may vary from some 35 at rest to below 20 during exercise at depth. It also varies somewhat between individuals. Compared to semi-closed rebreathers with constant flow this type of rebreather tends to give tighter control of the resulting O2 concentration which makes the choice of decompression tables easier. The endurance is determined by the diver’s actual gas consumption, not by a stop watch. Electronically controlled rebreathers represent a further sophistication of rebreathers and they also provide the tightest control of the O2 level. Typically, they control the partial pressure of O2 (pO2), but in principle they can control the concentration instead. These rebreathers determine the current pO2 and add O2 as necessary. Some can also change the desired pO2 (the setpoint) depending on depth, automatically or with diver input. The endurance time depends mostly on the oxygen consumption of the diver (i.e. how hard the diver works). A bottle of gas containing O2, and N2 and/or He (diluent gas) is used to add gas to the breathing loop during descent. Some rebreather divers prefer to be in control by adding O2 themselves. They can do this based on guidance from O2 sensors. The risk is that the diver gets distracted and forgets to add O2. To reduce this risk it is possible to have a constant flow of O2 that is enough to sustain life at resting levels. The European rebreather standard EN 14143 (1) allows such devices and the minimum flow of O2 has to be 0.5 L/min.  There are several principles that can be used to sense O2 levels in a rebreather. They have to withstand the widely varying conditions (such as water, high humidity, varying temperatures, changing gas density). They also have to respond fairly quickly to changes in O2 levels, be linear and be mechanically robust. The sensors used in almost all electronic rebreathers are galvanic sensors (sometimes called fuel cells or oxygen cells), their output is a voltage or current. They rely on O2 diffusing through a membrane from the breathing gas to the inside of the sensor. Inside the sensor are an electrode and an electrolyte. At the electrode the O2 takes part in a chemical reaction that produces an electric current that is related to the partial pressure of O2 (pO2). In other words, these sensors give a signal that is related to pO2, not O2 concentration. The resulting current is passed through a resistor (usually placed inside the sensor) that turns it into a voltage (typically in the range 10 to 25 mV in room air). Since the rate of diffusion of O2 across the membrane is temperature dependent, a temperature compensation circuit is typically included inside the O2 sensor itself. The electrode gets consumed in the chemical reaction and this limits the life span of these sensors. This is a type of sensor that works by shining light of a certain wavelength on a material that responds with light (fluorescence) at another wavelength. The intensity of the returning light can be related to the pO2. The lifetime is often determined by bleaching of the fluorescesing material. These rely on O2 passing through a certain material which results in a voltage across it. In practice, this sensor is very stable and is used as the oxygen sensor in every modern car with a gasoline engine. However, for the principle to work, the material must be heated to many hundreds of degrees Celsius. The power needed to maintain this temperature puts it out of the range of rebreathers. The lifetime seems to be very long. To test the O2 add system it is necessary to use the most sophisticated type of breathing simulator called a metabolic simulator. The simulator has to breathe like a human, i.e. the right sized breaths (tidal volume) at the right breathing frequency. It also has to exhale warm and humidified gas while consuming O2 and producing CO2. Figure 1 illustrates such a simulator. The cylinder and piston on the right act as the lungs of the diver. During an exhalation, the gas passes through the heating and humidification system to the rebreather on the left. During an inhalation, gas passes by a system that removes the correct amount of O2 for the minute ventilation (tidal volume * breathing frequency). A flow of CO2 is added in proportion to the minute ventilation. During tests, the rebreather will be immersed in water kept at the desired temperature and placed in a hyperbaric chamber pressurized to the desired depth. This type of testing is far beyond the capabilities of a diver and even most rebreather manufacturers. Manufacturers will usually have these tests done at one of the very few facilities in the world that have this capability. Figure 1. A schematic drawing of a breathing simulator used to determine the O2 levels in a rebreather. Arrows indicate the direction of gas. See text for details. For clarity, valves directing the flow are not shown, nor are the water bath and the hyperbaric chamber. When a manufacturer of an electronically controlled rebreather does early test of a new design there are two types of tests they can do: without CO2 addition or with CO2 addition. Each type of test has advantages and disadvantages, but running separate tests can allow the manufacturer to determine different aspects of the rebreather’s function. In tests without CO2 addition the rebreather will not see the effects of increased temperatures and humidity from the active scrubber. This way it is possible to just determine how well the electronics or computer software work in controlling the addition of O2 and how well the added O2 mixes with the gas in the rebreather. In tests with CO2 addition the heat and humidity generated by the scrubber will be seen by the O2 sensors. The changes in sensor output due to any temperature changes will be tested. Also, some of the humidity will condense and may collect on the opening of the O2 sensors. If enough condensation collects on a sensor it will lose contact with the gas and it will not give the correct readings. All tests done for certification purposes must be with CO2 addition so that the rebreather is tested in a way that the diver would breathe on it. 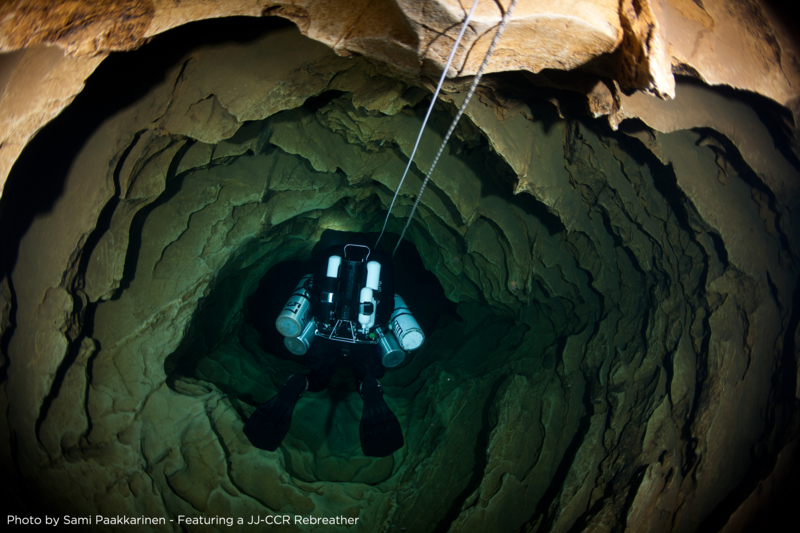 Common test results from electronically controlled rebreathers. Figure 2 shows a common pattern of the variations in the pO2 during use. The lower pO2 line (white) has a saw-toothed pattern. The diver consumes O2 which lowers the pO2. When the pO2 reaches a threshold the rebreather’s control system opens a valve which adds O2 to the breathing gas, raising the pO2 again.  The rebreather is capable of adding O2 faster than the diver consumes it, so the upward slope is steeper than the downward slope. In this example the average pO2 is 0.75 bar. The variation in pO2 is 0.05 bar (i.e. ±0.025). The upper line (blue) shows the pO2 in a rebreather that has a higher set point. In this case the average is 1.3 bar, with a variation of 0.1 bar. Figure 2. An illustration of commonly seen variations in pO2 in the inspired gas plotted against time for two setpoints of pO2. Depending on the response time of the O2 sensors, O2 injection point, flow rate of the O2 injection, the mixing of the gas, actions of the control system and other factors. In commercial rebreathers, the variation in pO2 will range from being almost imperceptible to quite large. The EN 14143 (1) states that the pO2 may vary ±0.1 bar. NOAA (2) accepts ±0.05 atm. When the rebreather switches set-points, the O2 control gets challenged. After an increase in set-point, the O2 add valve typically opens fully. Depending on how well the added O2 mixes in the breathing loop, how fast the O2 sensors react and how well the control system operates, there is a risk that the inspired pO2 keeps climbing even when the set point has been reached (and the O2 add valve has been closed). This is called an overshoot. This type of response is not unique to rebreathers, but is common in all types of control systems. Figure 3 shows how this may work. At first the average pO2 is 0.75 bar. After a couple of control cycles, the switchover started which causes the pO2 to rise. As shown, the pO2 reaches a peak of about 1.45 bar. The diver then consumes enough O2 to bring it down under normal control (average pO2 of 1.3 bar). Figure 3. An illustration of an overshoot in pO2 in the inspired gas. Another way that an overshoot might occur is during a rapid descent: assume that a rebreather maintains a pO2 of 0.75 bar at a depth of 5 msw (1.5 bar). It will then have an O2 concentration of 50% O2 in the breathing loop (0.75/1.5*100%). If the diver descends very rapidly (for simplicity: no O2 is consumed, nor is any diluent added) to 30 msw (4 bar, 100 fsw), the resulting pO2 would become 4*0.50 = 2.0 bar. Of course, during a normal descent with a real diver, some of the O2 in the breathing gas will be consumed and diluent gas will be added. The O2 in the diluent will be added to the breathing loop during descent even when the O2 add valve is closed. Thus the extra O2 from the diluent is out of reach of the O2 control system. Rebreathers have O2 add systems, not O2 subtraction systems. The magnitude of the overshoot will depend on several factors: the diver’s O2 consumption, rate of descent and final depth.  Mathematical predictions can give estimates of an overshoot, but tests are best for determining the overshoot. The EN 14143 (1) allows an overshoot to 2.0 bar and the pO2 may stay above 1.6 bar for one minute. A situation, related to the pO2 overshoots, happens when a diver makes an ascent. To maintain a desired pO2, the concentration of O2 must increase when the pressure (depth) decreases. The rebreather must be able to add O2 fast enough to prevent a dip in pO2 that is called undershoot. In a rebreather that maintains a pO2 of 1.3 bar at 30 msw the O2 concentration will be 32.5%. A very rapid ascent to 3 msw (10 fsw) would mean that the pO2 would drop to 0.42 bar. The pO2 set point would have changed to, say, 0.75 and the O2 add system will raise the pO2. The EN 14143 (1) allows the pO2 to go 0.5 bar below the set-point and it must be back under control within one minute. It must never go below 0.20 bar. There are several ways that sensors can stop working correctly. Some are listed here. All galvanic (fuel cell) type O2 sensors have a limited life span. They may last anywhere from a few months to a couple of years. Based on empirical testing (3) they can fail in more than one way: total failure (no signal at all), a gradual change in voltage, or an inability to generate the correct reading at a high pO2. The first mode is easy to detect, the other two are the hardest for a diver to detect. Sometimes a sensor will read the expected voltage in room air and with 100% O2 at 1 atmosphere. However, it may not be able to generate the right (linear) change at 1.3 or 1.5 bar. Unless the sensor has been tested before the dive at such pressures it is a risk that the diver takes. The effect of a sensor’s inability to produce the correct voltage at a high pO2 is illustrated in Figure 4. The straight, interrupted line represents what a sensor should produce. The red line shows the output of a sensor with the problem. This sensor would calibrate perfectly at 1 bar and allow pO2 control well up to about 1.3 bars. However, at higher pO2 the voltage is not as high as it should be. This can be seen when the red line deviates from the white one. At a pO2 of 1.5 bars the voltage is 2.4 mV low (equivalent to 0.045 bars). As mentioned above, the rebreather would add more O2 until it reads the voltage it is set for (if the setpoint were that high). The actual pO2 would be 1.545 bar, while the display reads 1.5 bar. Should this sensor be in a rebreather that sees an overshoot as high as 2 bars the pO2 display would only read 1.7 bars. A sensor with this kind of lack of linearity will have an actual pO2 that is higher than what the pO2 display shows. Figure 4. An illustration of an overshoot in pO2 in the inspired gas. Tests of one type of (U.S. Navy approved) O2 sensor showed the presented failure modes and additional kinds of failure modes (3). The report’s (3) Figures 1 and 2 show effects of decompression. Some sensors showed rapidly changing values towards the end of the decompression or a sudden jump in the output signal. They read normal values after some minutes or hours, but would fail shortly thereafter. As mentioned above, the temperature of the sensor may influence its reading because the built-in temperature compensation may not be perfect. Figure 3 in report (3) shows the effects of temperature for this particular sensor model. Some sensors increased their signal while others decreased theirs as temperature changed. Tests of another manufacturer’s sensors have shown theirs to all change the same way with temperature, e.g. the signal increased with increased temperature. To have the least influence of temperature on the combined output from several sensors, it is better to have the changes shown in Figure 3 (1). 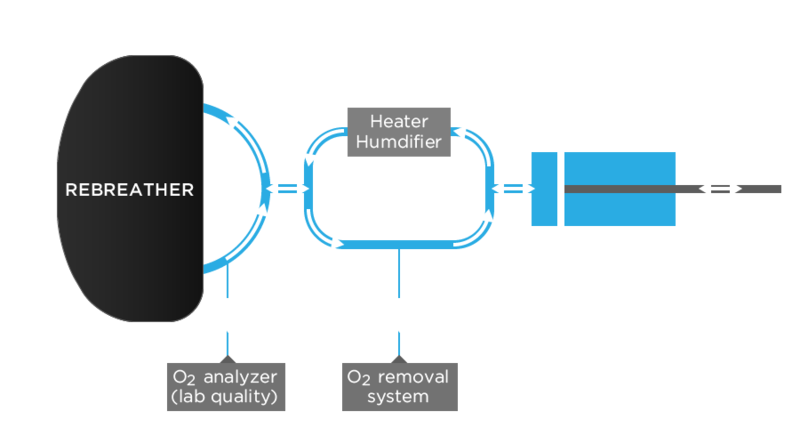 Based on actual measurements, the temperature of the gas leaving the CO2 scrubber will be the temperature of the absorbent until some 10 to 40 min into the dive. At that point the gas temperature starts to rise. The actual time depends on how hard the diver works and the size of the scrubber. The scrubber will commonly raise the gas temperature by 30 to 40 °C. Depending on the water temperature, the temperature of the gas leaving the scrubber will vary from close to 0 °C up to 50 °C, or even 60 °C. In short, the gas temperature at the O2 sensors will depend on how far from the scrubber they are, on water temperature and the length of the dive. It should be apparent that the temperature sensitivity of an O2 sensor can be critical. Some sensor manufacturers provide specifications for the range of temperatures they are designed for. In addition they may state how much their output might change with temperature. However, some simply state “compensated” or provide no specification at all.  A gradual error in one sensor (due to temperature changes around the sensor) during a dive is illustrated in Figure 5. In this example it is assumed that the rebreather has three sensors and that it can identify and remove one outlying sensor from its control logic. Further, it is assumed that the output signal for one (shown as a white line) increases with temperature and that the other two are not affected. At the beginning, all three sensors track each other well. At point A the warm gas from the scrubber reaches the sensors and their temperatures start to rise. The temperature climbs until point B. The white’s readings increase and then level off. Its readings change the same way as the other two’s, but it stays higher. After a dive and when the sensors have cooled off they will all read the same. A way to detect such sensors is to monitor the pO2 readings from the sensors during the dive and/or afterwards if the rebreather can log the readings. Figure 5. An illustration of a gradual drift in the pO2 readings in one sensor, the readings from the other two did not change. See text for details. At least one rebreather design has had the O2 sensors located such that each sensing surface was exposed to the warm gas leaving the scrubber while the opposite side of the sensor was at essentially water temperature. The temperature difference across each sensor can be up to 40 °C. It would be very critical that the temperature sensor inside the O2 sensor be placed in the correct place for the sensor to have a chance to work right. Ideally, the entire sensor should be at the same temperature. There are many types of rebreather designs, from very basic to very sophisticated ones. For all but the 100% O2 rebreather, the pO2 delivered in the diver’s inhaled gas must be measured to verify that it stays within desired levels. This includes tests at different depths, different water temperatures and different diver workloads. 1: “Respiratory Equipment – Self-contained re-breathing diving apparatus”, Brussels (Belgium): European Committee for Standardization; 2013, EN14143:2013 (E). 2: National Oceanic and Atmospheric Administration minimum manufacturing and performance requirements for closed circuit mixed gas rebreathers, 2005. Downloaded from http://www.omao.noaa.gov/sites/default/files/documents on 10 Jan 2017 (file NOAA_CCR_Standards_Final_2005.pdf). 3: Warkander D.E. Unmanned Test and Evaluation of the Teledyne Analytical Instruments R-10DN Oxygen Sensor for Use in the MK 16 Mod 1 Underwater Breathing Apparatus. U.S. Navy Experimental Diving Unit, Technical Report TR 03-08, 2003. Downloaded from www.rubicon-foundation.org on 28 Nov 2016 (file ADA448759.pdf). Excellent article. It is unfortunate though (albeit not unusual or unexpected) that misinformation is propagated regarding “Fully mechanical 100% O2 rebreathers”. I own and dive the Siel OMG Castoro C96 Pro CE oxygen rebreather, and am certified to dive it by Innerspace Explorers under authorization by the Italian NATO manufacturer. As oxygen rebreather divers, we assume 80% oxygen in the breathing loop – although in practice it is always lower than that and drops steadily between counterlung purges. This is the natural operation of Boyle’s Law where the highly Nitrogen-saturated human body breathes from the high concentration oxygen environment of the breathing loop and offgases Nitrogen into it. An O2 rebreather has a maximum operational depth of 10 meters in recreational use.